Atyabi, F., Mohammadi, A., Dinarvand, R. (2005). Preparation of Nimodipine Loaded Microspheres: Evaluation of Parameters. Iranian Journal of Pharmaceutical Sciences, 1(3), 143-152. Fatemah Atyabi; Afsaneh Mohammadi; Rassoul Dinarvand. "Preparation of Nimodipine Loaded Microspheres: Evaluation of Parameters". 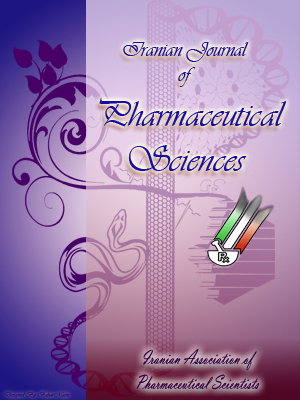 Iranian Journal of Pharmaceutical Sciences, 1, 3, 2005, 143-152. Atyabi, F., Mohammadi, A., Dinarvand, R. (2005). 'Preparation of Nimodipine Loaded Microspheres: Evaluation of Parameters', Iranian Journal of Pharmaceutical Sciences, 1(3), pp. 143-152. Atyabi, F., Mohammadi, A., Dinarvand, R. Preparation of Nimodipine Loaded Microspheres: Evaluation of Parameters. Iranian Journal of Pharmaceutical Sciences, 2005; 1(3): 143-152. The purpose of this study was to prepare and characterize nimodipine loaded microspheres using ethyl cellulose (EC) as a carrier polymer through an emulsion solvent evaporation method. These evaluations characterized the pattern of drug release from prepared microspheres. Nimodipin loaded microspheres were prepared using an emulsification solvent evaporation method. The effect of process variables such as stirring rate, drug polymer ratio in the organic phase, the viscosity of the dispersed phase and the emulsifier concentration, on the morphology of microspheres, particle size distribution, drug content and in vitro release profile of nimodipine were investigated. The prepared microspheres were spherical with smooth surface. The mean diameter of microspheres decreased with increasing the concentration of the emulsifier in the continuous phase and stirring rate of the medium. However, increasing the viscosity of the dispersed organic phase increased the particle size of microspheres. Both the drug and polymer concentration in the organic phase increased the entrapment of nimodipine in ethyl cellulose microspheres. Drug content of the microspheres was lowered by increasing the viscosity of the dispersed phase and increasing the concentration of poly vinyl alcohol. The rate of drug release from microspheres was directly influenced by the drug to polymer ratio, as any increase in this ratio allowed the higher release rates from microspheres. The higher the polymer concentration the lower was the rate of drug release from microspheres. Nimodipine is very sensitive to light . It is highly crystalline and practically insoluble in water and acidic or alkaline aqueous media. Due to its low aqueous solubility, following oral administration, poor absorption is observed. Its elimination half-life is approximately 1-2 hours which is regarded as very short. In order to improve the therapeutic efficiency of nimodipine, many authors have developed sustained release formulations . controlling the drug release rate, decreasing the administration frequency and protection from degradation processes, photosensivity and oxidation [3, 4]. Microspheres as a multiple unite dosage form offers obvious advantages for oral administration of drugs. They spread out more uniformly in the GI tract, reducing exposure of the mucosa to high concentrations of drug and ensuring more reproducible drug absorption . The risk of dose dumping also seems to be considerably lower than with a single unit dosage form. The purpose of the present study was to prepare and characterize nimodipine loaded microspheres using ethyl cellulose (EC) as a carrier polymer through an emulsion solvent evaporation method. These evaluations characterized the pattern of drug release from the prepared microspheres. The influence of process variables such as stirring rate, drug:polymer ratio, viscosity of the dispersed phase and polyvinyl alcohol (PVA) (emulsifier) concentration, on the physical characteristics of microspheres, morphology, particle size distribution, drug content and in vitro release profiles of microspheres were investigated. Figure 1. Optical microscopy photograph of prepared microspheres. Nimodipine (FIS, Italy) and ethyl cellulose (Ethoxy Content 48% and 10 CPS, from Ichiga, Japan) were kindly donated by Sobhan Pharmaceutical Co., Iran. Dichloromethane (DCM), polyvinyl alcohol (PVA, MW 72000), sodium lauryl sulfate (SLS) were purchased from Merck, Germany. All other materials were of analytical grade. phase containing 300 mg EC and external phase containing 400 mg PVA. All experiments were carried out under subdued light (sodium light) to prevent photodegradation of nimodipine. Microspheres were prepared by a classical emulsion solvent evaporation method. Briefly, known amounts of polymer (EC) and nimodipine were dissolved in 5 ml of DCM as the internal phase. The prepared clear organic solution was then added drop wise to a solution of PVA in water, which acts as the external phase. The mixture was stirred by an external stirrer (Heidolph, Germany) to form a stable O/W emulsion system. Stirring was continued for up to 4 h to allow complete evaporation of dichloromethane and formation of solid microspheres. The prepared microspheres were filtered, washed with excess of water and dried at the room temperature. Different prepared formulations are given in Table 1. Table 1. Nimodipine microspheres formulations and drug loading yield. The morphology of microspheres was studied using optical microscopy (Olympus CH 30). The particle size distribution of the microspheres was determined by standard sieves. Table 2. The solubility of nimodipine in different media in the presence of different co-solvents. A 10 mg sample of the prepared microspheres was dissolved in 10 ml of dichloromethane. The drug content of microspheres was determined spectrophotometrically at 342 nm. In this condition ethyl cellulose does not interfere with the UV absorption of nimodipine. The solubility of nimodipine in different media in the presence of different co-solvents was determined. Ten mg of nimodipine was placed in glass bottles containing 100 ml of different solvents. Bottles were thoroughly shaken for 24 h and kept aside for 2 h at the room temperature. Solutions were filtered, and the filtrate was collected in dry containers. Solutions were analyzed spectrophotometrically at their respective maximum absorption wavelength for nimodopine. Dissolution studies were performed using USP XXIV apparatus (II) (Erweka DT6, Germany) using the rotating paddle method. Nine mg of the prepared microspheres were located in each cell of dissolution tester filled with 900 ml of the dissolution medium consisting 2% w/v sodium lauryl sulfate in distilled water [2, 6]. The study was performed at 37±0.5 °C with a stirring rate of 60 rpm. Samples of 4 ml were taken at 0.5, 1, 2, 4, 6 and 8 hours and filtered through 0.45 µm membranes (Millipore, USA). Nimodipine concentration of samples was determined spectrophotometrically at 240 nm. Table 3. Percent of drug loading in prepared samples. Figure 3. Effect of ethyl cellulose concentration of internal phase (mg) on particle size distribution of microspheres prepared at stirring rate of 500 rpm. Figure 4. Effect of drug to polymer ratio on particle size distribution of microspheres prepared at stirring rate of 500 rpm, internal phase containing 300 mg EC and external phase containing 400 mg PVA. The goal of this study was to develop a sustained release system for nimodipine. The solubility of nimodipine in different media having different co-solvents is shown in Table 2. From this experiment, it was found that the medium prepared with distilled water containing 0.3% sodium lauryl sulfate gives the best solubility in comparison with other media (57 µg/ml). Nimodipin loaded microspheres were prepared by a solvent evaporation method. The effect of stirring rate, drug:polymer ratio in the organic phase, the viscosity of the dispersed organic phase, and the emulsifier concentration in the continuous aqueous phase during preparation, on the microspheres characteristics (size, drug entrapment efficiency and nimodipine release rate) were investigated. Different microspheres formulations were prepared which are listed in Table 1. Externally, the particles were spherical and had a smooth surface as shown in Figure 1. The influence of the stirring rate on the external morphology of the microspheres was observed as faster stirring rate (resulted in the formation of irregular particles). High drug loaded microspheres (70%) were not as smooth as low drug loaded microspheres, and their surfaces were covered with drug crystals. The effect of stirring rate on the particle size distribution is shown in Figure 2. As it is shown, by increasing the rate of stirring from 200 rpm to 800 rpm, the mean particle size of microspheres decreased from 300-500 µm to less than 150 µm. This is expected because high stirring rates provide the sheering force needed to break down the oil phase into smaller droplets [7, 8]. Increasing the concentration of EC in the internal phase from 100 mg to 300 mg resulted in the formation of bigger microspheres (Figure 3). This observation may be attributed to an increase in the viscosity of the internal phase, making the coalescence of the emulsified dispersed droplets easier . The higher the viscosity of the internal phases (microemulsin droplets), the greater the amount of the energy required to break the droplets into smaller particles . Figure 4 shows that as the ratio of nimodipine to polymer (EC) was changed from 1:3 to 1:1 while the amount of EC was kept constant, the mode fraction size of microspheres increased. This effect is similar to the observed impact of the concentration of EC on the particle size distribution of microspheres. However, while the amount of EC was kept constant (300 mg), increasing the amount of drug increased the total (drug and polymer) content of the internal phase, and as a result bigger droplets and bigger microspheres were formed. Table 3 shows that the drug loading of microspheres is affected by EC, PVA, drug concentration and stirring rate. Low entrapment efficiency obtained from a solvent evaporation method reflects the ability of the drug to partition in the aqueous phase prior to microspheres solidification . On the other hand, the difference between theoretical and measured values is likely to be due to the loss of nimodipine resulting fromenhancement of its dissolution in water following its incorporation in DCM. The drug entrapment efficiency of microspheres was increased with increasing the concentration of the drug and EC. The drug entrapment efficiency of microspheres was also improved with changing the concentration of drug and EC in the internal phase to the higher concentration. This may be due to the increase in the viscosity of the internal phase that reduces the migration of the drug molecules in the aqueous phase. Any increase in the stirring rate or the PVA concentration facilitates dissolution of nimodipine in the aqueous phase and, as a result, drug loading is decreased. The solubility of nimodipine in different media in the presence of different co-solvents is shown in Table 2. To interpret the finding of this study, the most media were water and acetate buffer. The effect of drug:polymer ratio on the nimodipine release from microspheres is shown in Figure 5. Drug release from microspheres is notably affected by the ratio of the drug to the polymer as increasing in the first causes faster drug release. By increasing the amount of drug loading, a point will be reached when the solid drug particles upon dissolution will begin to form continuous pores or channels within the matrix. Under these circumstances, the path of release for drug molecules will be diffusion within the channels formed from areas where drug has previously leached out from the matrix [11,12]. In other words, as the amount of drug content is increased the matrix will become more porous as drug is leached out from the polymer and thus faster drug release rate occurs. The profile of drug release from microspheres with drug to polymer ratio of 1:3 seems to be different from those microspheres with drug to polymer ratio of 2:3 and 3:3. The effect of polymer to drug ratios on the drug release profiles are shown in Figure 6. The concentration of polymer has a reverse effect on drug release as the release rate of nimodipine decreased by applying more polymers in the matrix. This showed that the release rate is controlled by the matrix thickness. As the matrix thickness increased (polymer to drug ratio of 3:2) the release rate of nimodipine reduced and liberation of the active ingredient was incomplete. This finding is in accordance with the results found in previous studies [13, 14]. As it can be seen in Figure 7, the rate of drug release was highly influenced by the initial drug loading. It can be seen that by increasing the drug loading from 20% to 70% the rate of drug release from microspheres increased dramatically. This is in good agreement with the results reported by Filipovic-Grcic et al. , in their work on the nifedipine-loaded chitosan microspheres and Tefft and Friend  from herbicide-loaded microspheres investigation. The effect of particle size on drug release from microspheres with the same drug content (70%) is shown in Figure 8. The nimodipine release rate from smaller microspheres is higher than from larger microspheres, due to the greater surface area of smaller microspheres. Figure 5. Effect of drug to polymer ratio on release from microspheres with the same size rang. Figure 6. Effect of polymer to drug ratio on release from microspheres with the same size rang. Figure 7. Effect of drug loading on release from microspheres with the same size rang. It can be concluded that, emulsification/ solvent evaporation technique is a reproducible and simple method for the preparation of nimodipine microspheres. However, the use of ethyl cellulose for the microsphere preparation has limitations, since it delays drug release at a longer period which is suitable for oral drug delivery systems. Only microspheres smaller that 150 µm in size with drug contents higher than 70% (w/w) and microspheres particle size 150-300 µm with polymer:drug ratio 1:2 released more than 80% of their drug content in 8 hours. Ragno G, Veronica M, Vetuschi C. Analysis of nimodipine and photodegradation product by derivative spectrophotometry and gas chromatography. Int J Pahrm 1995; 119;115-9. Guyot M, Fawaz F. Nifedipine loaded-polymeric microspheres: preparation and physical character- istics. Int J Pharm 1998; 175: 61-74. Hogan SA, O’Riordan ED, O’Sullivan M.Microencapsulation and oxidative stability of spray-dried fish oil emulsions. J Microencap 2003; 20: 675-88. Kim HK, Park TG. Microencapsulation of human growth hormone within biodegradable polyester microspheres: protein aggregation stability and incomplete release mechanism. Biotechnol Bioeng 1999; 65: 659-67. Eyles JE, Alpar HO, Conway BR, Keswick M. Oral delivery and fate of poly (lactic acid) microsphere-encapsulated interferon in rats. J Pharm Pharmacol 1997; 49: 669-74. Qureshi SA, Caille G, Brien R, Piccirilli G, Yu V, McGilveray IJ. Application of flow-through dissolution method for the evaluation of oral formulation of nifedipine. Drug Dev Ind Pharm 1994; 20:1 869-82. Dinarvand R, Mirfattahi S, Attyabi F. Preparation, characterization and in vitro drug release of isosorbide dinitrate microspheres. J Microencap 2002; 19: 73-81. Yang Q, Owusu-Ababio G. Biodegradable progesterone microsphere delivery system for osteoporosis therapy. Drug Dev Ind Pharm 2000; 26: 61-70. Tamilvanan, S, Sa B. Studies on the in vitro release characteristics of ibuprofen loaded microspheres. J Microencap 2000; 17: 57-67. Jones DS, Pearce KJ. An investigation of the effects of some process variables on the microen- capsulation of propranolol hydrochloride by the solvent evaporation method. Int J Pharm 1995; 118: 199-205. Cardinal JR. Matrix systems. In: Langer RS, Wise DL, (editors). Medical applications of controlled release systems. Vol. 1. Philadelphia: CRC Press Inc., 1984; pp. 41-3. Song SZ, Cardinal JR, Kim SW. Progestin permeability through polymer membrane, V: progestrone release from monolitic hydrogel devices. J Pharm Sci 1981; 70: 216-21. Ozyazici M, Sevgi F, Ertan G. Sustained release dosage form of nicardipine hydrochloride: application of factorial design and effect of surfactant on release kinetics. Drug Dev Ind Pharm1997; 23: 761-70. Bergisadi N, Gurvardar D. Studies on piroxicam microcapsules and in vitro release kinetics. Acta Pharm Turc 1989; 31: 161. Filipovic-Grcic J, Becirevic-Lacan M, Skalko N, Jalsenjak I. Chitosan microspheres of nifedipine and nifedipine-cyclodextrin inclusion complexes. Int J Pharm 1996; 135: 183-90. Tefft J, Friend DR. Controlled release herbicide formulations based on polymeric microspheres. J Control Release 1993; 27: 27-35.